You are currently browsing antonialevy’s articles. Use different modes (pictorial, verbal, tactile) of presentation for essential information. Practical examples for this principle are tactile features on numeric keypads for blind users, which usually include a dot on the 5 key, a tactile circle on the enter/confirm button and a tactile x on the cancel/clear button. Consumer devices such as thermostats or infrastructure such as pedestrian signals now employ a combination of tactile, visual, and audible cues to be accessible to all. In education, this principle calls for providing essential information in a variety of modes (e.g., written, symbolic, tactile, verbal) thereby ensuring effective communication with all users regardless of their sensory abilities. This includes making all (online) instructional materials accessible to users of screen reading software as demonstrated in this video. For an expert account of how screen readers, we turned to guest contributor Chris Kchao, who handles assistive technology in the Office of Student Disability Services here at CUNY SPS. Start menu, Search Box, edit: Search programs and files. By way of these prompts, a user is informed not only of what the screen says, but also how to proceed. Among other things, we’re told that a menu is present, and that we’re focused on an edit field in which we may begin entering text. When a screen reader encounters a document embedded on a website or posted in a Blackboard course site and the user opens it, that document also needs to be accessible to the screen reading software in order for a visually impaired person to access the content. PDF documents, for example, are only accessible when text contained in them is searchable. They should include other “hidden” features, called tags that are added for accessibility purposes only and have no visible effect on the PDF. Such tags include descriptive text for images (called Alt Text) or structure tags (called headings) added to titles, subtitles, etc. Note that most PDFs created using a scanner are considered inaccessible because they are simply images of the page, which means that a screen reader cannot recognize any of the text. For various ways to make PDF documents accessible to all, see our quick guide or video tutorial with detailed instructions. PDFs may also be created by conversion from another type of file, such as Word or PowerPoint. If you follow accessibility guidelines when creating those source documents, and then “save as” a PDF, the accessibility features such as headings or Alt Text for images will carry over into your PDF document. See our Accessibility Resources Site for additional tutorials explaining how to create accessible Word, Excel, and Powerpoint documents as well adding captions to your YouTube videos. This article is part of an ongoing series introducing the concept of Universal Design (UD) as it applies to the context of higher education and to our work at CUNY SPS. Each installment covers one of the seven principles of UD with practical examples for both faculty and staff, including things you might not immediately associate with accessibility—or inaccessibility. Catch you next time! Questions or feedback? Email Antonia Levy or Christopher Leydon. General design examples for this principle include the moving sidewalks found in airport terminals and other public spaces, or the kind of lavatory faucets that make their operation readily apparent and relatively easy. Remember instruction manuals that either use overtly technical terminology or visual instructions that are impossible to follow? Instructional materials would be readily accessible to more people if they take into account the principle of simple and intuitive design, for instance by combining plain language and drawings alongside the text. Avoiding unnecessary complexity and jargon applies to any instructions—including those created by university offices for use by staff, faculty, and students. The design of our campus facilities should facilitate immediate understanding about the purpose and utilization of each design feature. Moreover, its means of use should be intuitively obvious so that it operates as anticipated by the user who can, therefore, use it spontaneously. For a faculty perspective this month, we invited Julie E. Maybee, Associate Professor of Philosophy at Lehman College and Adjunct Associate Professor of Disability Studies here at CUNY SPS, who suggests a number of ways to apply this principle to the design of online and hybrid courses in Blackboard (Bb). To make course navigation more simple, I aim to minimize the number of clicks required for students to figure out what work they need to do each week. I create a folder for each week in a content area on Bb called “Weekly Modules” or “Weekly Folders.” The folder description includes the date range for each week, as well as special due dates (such as for essays, or drafts of the final paper)—hence, the “Weekly Folders” section almost serves as a course calendar as well. Links, with assignment instructions, to the specific Bb tools students will use to submit their work, e.g. a link to the relevant discussion board (or blog) or to submit an assignment. Each folder is thus a completely self-contained place where students can go to complete all their work for the week. There are also a few ways to make the course design more simple and intuitive. For one, providing multiple access points to the same items can help your students to navigate the course site more easily. For example, aside from the links in the Weekly Folders, I provide shortcuts to the discussion board or blog on the course menu for faster access. In addition, I create a link to the “Help with Writing the Final Paper” folder both within the “Assignment Information” section (for students looking for information about the assignment) as well as the “HELP!” section of the course (for students who think in terms of needing help with the paper). In other words, whichever way they might think, students will find a link to the information they are looking for in either place. Also, limiting the variety of tools you assign is an easy way to simplify the design of your course—for both the instructor and the students. Each feature in Blackboard works a little differently; e.g., replying to a discussion forum is different than commenting on a blog or editing a wiki, and using the assignment tool is different from taking a test. So, instead of trying to use them all, I give similar assignments from week to week, or at least in multiple weeks. For instance, in some of my courses, students do the exact same discussion assignment for weekly readings: students must post four posts to the discussion board, some of which must answer study questions I provide on each of the readings, and some of which must respond to my or other student’s posts. Making your assignments repetitive also helps to convey your course expectations to students. When an assignment is the same every week, students will find it easier to learn what they are expected to do, and they also have multiple opportunities to learn (and respond to) your expectations for that kind of assignment. If you then grade the discussion every week—preferably by using rubrics, which Blackboard makes fairly easy to do—you will also be providing consistent feedback to students that helps them to understand what these expectations are. Last but not least, assigning different levels of writing assignments helps to accommodate students with a wider range of literacy and language skills. Since I do not typically grade discussion posts for grammar and style, I use the discussion board as a place where students can write more informally. Short blog/paper assignments can be helpful as a scaffold for the final paper by giving students lower-stakes opportunities to practice skills they will need when completing the more significant assignment later. In my own discussion posts and in grading feedback, I encourage students to provide citations to back their claims, to interpret quotations in their own words, to offer scholarly evidence from the readings for their views, and so on. These are just a few ideas about some of the ways our courses can be more simple and intuitive—and hence more accessible—for students. This article is part of an ongoing series introducing the concept of Universal Design (UD) as it applies to the context of higher education and to our work at CUNY SPS. Each month we cover one of the seven principles of UD with practical examples for both faculty and staff, including things you might not immediately associate with accessibility—or inaccessibility. Catch you next month! Questions or feedback? Email Antonia Levy or Christopher Leydon. Provide adaptability of the user space. Practical examples for this principle include not only the familiar architectural features like restrooms and other facilities that are physically accessible to individuals who use wheelchairs or face other mobility challenges, but also consumer items like scissors or computer mice made for both left and right handed users. This UD principle is important because design that fails to provide flexibility in use can lead to problems that are hard to fix later on. One enormous example of this kind of failure is the Verrazano Narrows Bridge, which accommodates cars, trucks, and busses. Yet when it was build fifty years ago, no provision was made for a rail link between Brooklyn and Staten Island, nor for use by pedestrians or cyclists. The latter is currently being considered though it entails an expensive retrofit. An emphasis on flexibility when designing products or environments brings into focus the difference between accessible (or barrier free) design and universal design. While the former is legally mandated to permit access for those who may be excluded because of a disability, universal design aims at inclusiveness in a broader and more integrated sense. In a university environment, disability services offices are usually tasked with primary responsibility for providing support to students with disabilities. This approach is based on the accommodation model, in which reactive adjustments are made by request to render an educational environment accessible to an individual with a disability. (In the case of a faculty or staff member, such requests are submitted to the human resources office, which arranges for reasonable workplace accommodations.) By contrast, a proactive UDL approach promotes the expanded goal of making these environments welcoming and inclusive from the start to groups that are diverse in many dimensions, including gender, race and ethnicity, age, socio-economic status, ability, or learning style. Such consideration on the front end helps prevent the need to redesign down the road when a user arrives on campus and indicates the lack of accessibility. More concrete examples include UDL-inspired classroom furniture such as tablet desks that can accommodate both left and right handed users or height-adjustable tables that can easily accommodate a range of user sizes and preferences. Furniture that can be readily moved allows us flexibility for different learning activities and student groupings. For staff, allowing for various delivery methods of documents to the school (by mail, fax, hand delivery, web form, or email attachment) or of paychecks to employees (by mail, direct deposit, or pickup) are consistent with the practice of flexibility in use. The School’s new website includes responsive design elements in its code (HTML5 and CSS3) that allow for automatic re-sizing to accommodate access from phones, tablets, laptops, and desktop computers. Blackboard, our learning management system, is also available through mobile app. And even CUNYFirst has features that provide accessibility and flexibility of use. This principle applies as much to teaching and learning—whether online or in a brick-and-mortar classroom—as it does to the physical campus. The diversity of students we encounter include a variety of learning styles and preferences: Learners might differ in the ways that they perceive and comprehend information, the ways that they can navigate a learning environment and express what they know, as well as in the ways in which they can be engaged or motivated to learn. By utilizing varied instructional methods to include different modes of learning and different learning preferences, we not only meet the needs of students with the greatest barriers, but also improve access for a wide range of learners. If you are curious, check out this questionnaire by VARK Learn to find out about your own learning preferences. Instructors could use the questionnaire as an icebreaker during the first week of classes to start a discussion with students about the way you teach and they learn. Darby, Alexa (n.d.). Understanding Universal Design in the Classroom. National Education Association (NEA): http://www.nea.org/home/34693.htm (Accessed January 11, 2016). The Center for Universal Design, NCSU (n.d.) Introduction to Universal Design. https://www.ncsu.edu/project/design-projects/sites/cud/content/UD_intro.html (Accessed January 11, 2016). Last month we defined Universal Design (UD) as a concept for including accessibility in everything we do. There are seven principles of UD, all of which seek to promote access and consideration of diversity as integral parts of what we make and do, rather than an afterthought. This month we introduce the first UD principle, equitable use. Making the design appealing to all users. For example, curb cuts: designed to accommodate wheelchair users, they also benefit anyone pushing a stroller or shopping cart and kids on skates or scooters. The point of UD is not just to build in access for people with disabilities, but to improve the user experience for the widest possible range of people. As discussed previously, UD has also been applied to many educational products, such as computers, websites, software, and textbooks, and to environments such as classrooms, libraries, and online education. In practice, Universal Design in Education (UDE) can benefit all students, while reducing or even eliminating the need for students with disabilities to request individual accommodations. For instance, captioning of videos used in class provides equitable use of those instructional materials for students who are deaf or hard of hearing. But captions are also useful to English language learners (ELL), students with certain learning disabilities, and anyone who searches the time-stamped transcript of the video to review a particular topic. Want to find accessible videos online? Here is how to using Google Search: On the page displaying your search results, select “Video,” then click on “Search Tools” and change “All videos” to “Closed Captioned.” See screenshot below. Posting job listings in formats accessible to people with a broad range of abilities and disabilities, racial and ethnic backgrounds, and ages. This article is part of an ongoing series introducing Universal Design (UD) as it applies to the context of higher education and to our work at CUNY SPS. Each month we will cover one of the seven principles of UD with practical examples for both faculty and staff, including things you might not immediately associate with accessibility—or inaccessibility. Catch you next month! Questions or feedback? Email antonia.levy@cuny.edu or christopher.leydon@cuny.edu. What is the first thing that comes to mind when you hear the word accessibility? Ramps, designated bathroom stalls, closed captioned video, or maybe screenreading software? While these things allow people with physical disabilities or sensory impairments to use the school’s facilities, creating a truly inclusive institution involves more than making architectural adjustments or offering technological aids. It means building accessibility into all services we offer — including our website and the videos posted on it, online course sites and the documents posted on them, and even the forms used by admissions, financial aid, or human resources. Implementing Universal Design means considering accessibility in every decision we make, and all of the tasks we perform. With UD, accessibility isn’t the icing on the cake, instead it’s baked right in. This article kicks off a monthly series introducing Universal Design (UD) as it applies to the context of higher education and to our work at CUNY SPS. Over the coming months we will cover each of the seven principles of UD with practical examples for both faculty and staff, including things you might not immediately associate with accessibility — or inaccessibility. Catch you next month! Burgstahler, S. E. (2008). Universal Design in Higher Education. In S. Burgstahler & R. Cory (Eds. 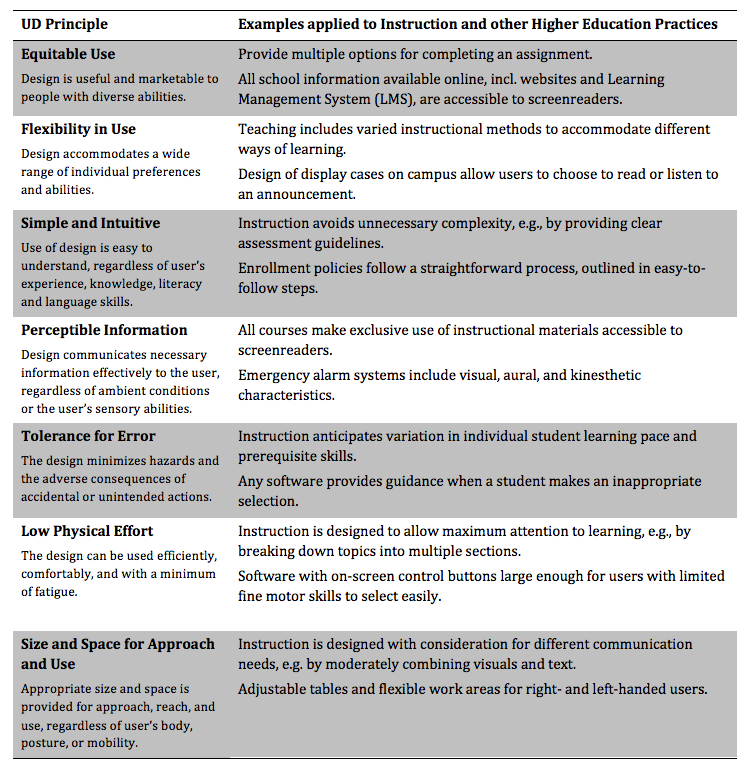 ), Universal Design in Higher Education: From Principles to Practice, 3-20. Cambridge, MA: Harvard Education Press. UDL Online Project. (2009). Examples of UDI in Online and Blended Courses. Center on Postsecondary Education and Disability, University of Connecticut, Storrs.